Armoured Car – 4000+ built 1960-85. 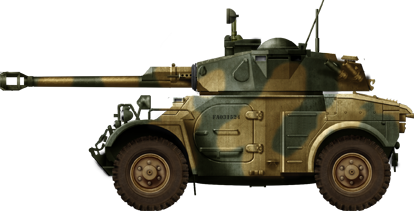 By 1950 the heavy and complex Panhard EBR entered service. However, the general staff needed a lighter and even faster reconnaissance vehicle for patrolling colonial areas and numerous other tasks open to cheaper vehicles. 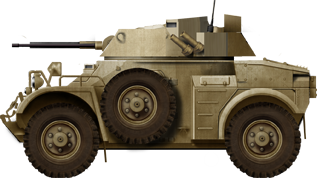 As a stopgap measure, the government purchased British Daimler Ferrets, widely used in the counter-insurgency of the Algerian War, whereas the heavier EBR and the wartime M8 Greyhound were not found less mobile. The condition of this threater of operations, made of fast skirmishes in mountaineous terrain, imposed a vehicle capable of indirect fire with a mortar, and a vehicle easier to operate and to maintain (the levied “Contingent” sent there was made of raw recruits then). 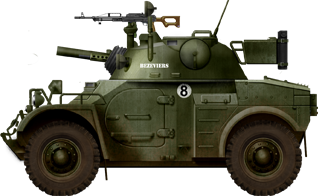 So in 1956, the French Government issued a specification for a vehicle of similar dimensions and layout to the Ferret, t mounting a breech-loading mortar. 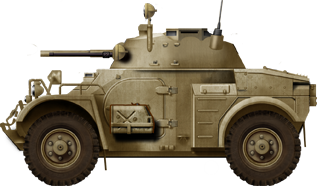 Panhard answered the call promptly with the Model 245 Auto Mitrailleuse légère (light armoured car) or A.M.L. in 1959, which was tested at the same time as Saviem and DEFA-AMX models, but accepted for service. Indeed engineers of Panhard took the time to made a thorough and detailed examination of the British Ferret. 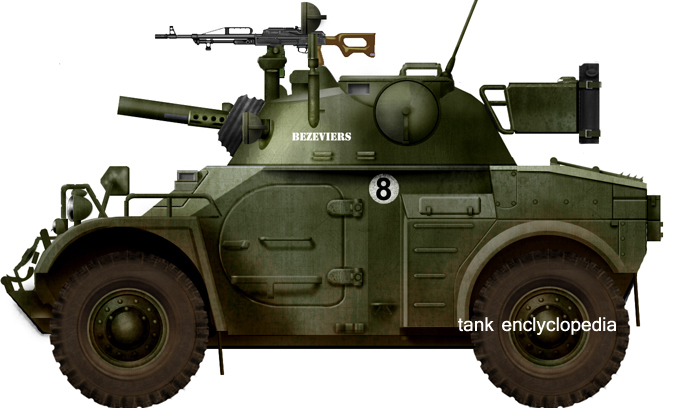 The AML was equally light, small, with an all-welded hull, Panhard 4-cylinder petrol engine at the rear and a central fighting compartment topped with a turret, at first a simple cupola from which emerged the Brandt mortar, and later much heavier and roomier than on the Ferret to house 75 mm and even 90 mm guns. The 1.99 l (121 cu in) Model 4 HD flat 4-cylinder air-cooled petrol gave 90 hp (67 kW) at 4,700 rpm for a Power/weight of 16.36 hp/tonne (11.9 kW/tonne). Consumption was 25 liters/100km, Autonomy : 600 km or 15 hours, with a 150 liters gasoline tank. Maximum speed on road was 92 km/h, turning radius 6 m, it could climb a 60% slope, and with a 0,33 m ground clearance, climb a 0.30 m vertical obstacle(m), cross a 0.70 trench or ford 1,10 m of water. The driver was positioned in the middle, and the two men fighting crew, including the commander, took place behind him. Access was granted by two side doors. The four 16 in (41 cm) diameter roadwheels were independantly sprung by coil springs, but only the front ones were steered. It had drum brakes but the AML lacks hydraulic assist. Its tyres used nitrogen-filled inner tubes (Hutchinson V.P.-P.V.s) which provided run-flat capability. These 11 in (280 mm) wide Michelin tires can be deflated to only 16 to 10 psi to ease ground pressure on soft ground, especially sand. AML 60 S530 (Venezuela, 12 vehicles) self-propelled dual 20 mm cannons for AA defence. This system was developed by SAMM (Societe d\’Applications des Machines Motrices). These guns are fed by 600 rounds and the gunner can select single shots, bursts or full automatic. 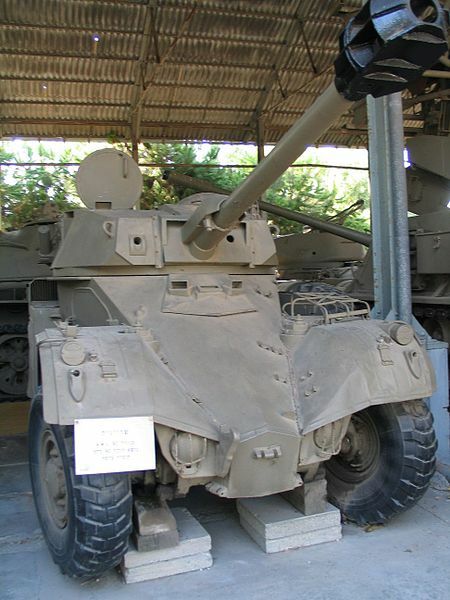 South Africa produced the Eland 60 in 1962: A local version of AML 60 HE60-7 (see South Africa for more). 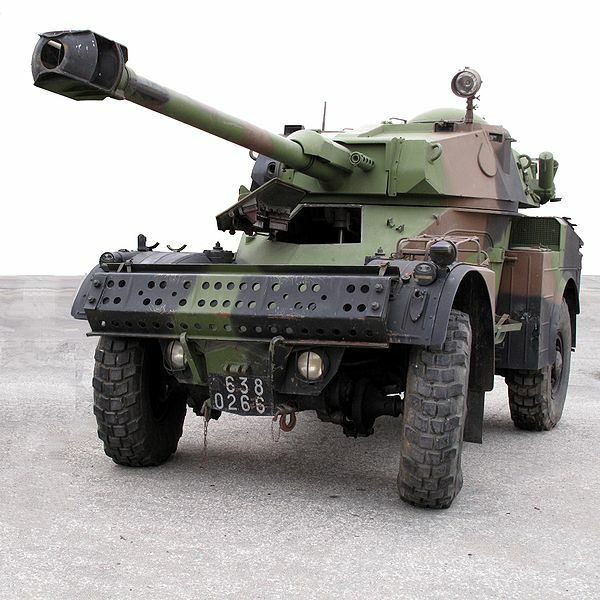 The AML 20 of Irish Army version was based on the AML 60 but with a 20mm cannon. Another version had its machine-guns replaced by Manroy 0.5 in (12.7 mm) M2 HB QCB (Quick Change Barrel) machine gun. The Panhard AML early prototypes were unveiled in mid-1959 and the pre-production took place in 1960. As early as 1961, at least one regiment in Algeria was tested the vehicle in operations. It was equipped then by a fully orientable 60 mm Brandt gun-mortar (with 53 rounds in store) or a DTAT CS61/67 mortar, assisted by two MAS AA-52 NF-1 LMGs. 0.3 cal. machine-guns and a 12.7 mm HMG with 1200 rounds. However the Algerian war was approaching to a close, the need of vehicles for close support with indirect fire was less paramount. Engineers seeked to increase the firepower, to face equivalents of the Soviet forces. Most likely in western Europe, airborne fighting vehicles was considered then a major threat. 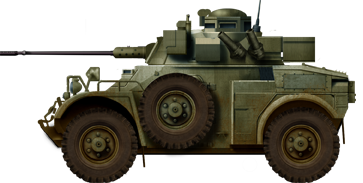 At the same time, South Africa, then a customer of the AML, charged Panhard technicians of up-gunning the AML. So a new turret was devised, able to house the massive Giat Industries’s 90 mm F1 gun. This model, equipped with the 90 mm gun which could fire HE and Frag ammunitions, was declined into two variants, and several derivatives. 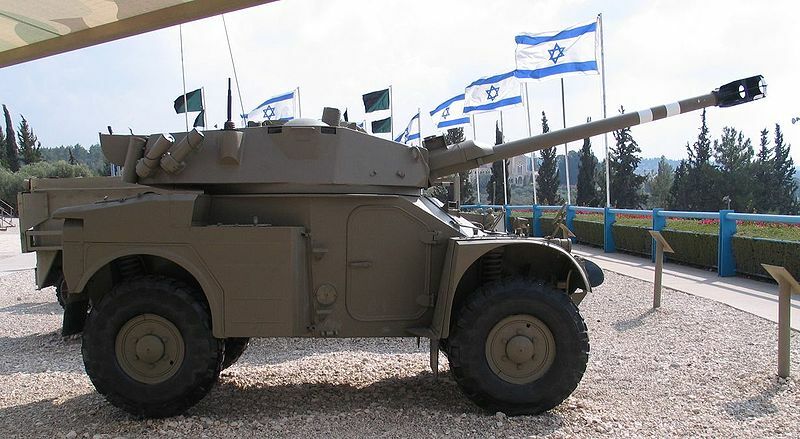 The AML 90 Lynx had a new turret designed by Hispano-Suiza, mounting the same rifled 90 mm GIAT F1 but featuring a passive night vision equipment, a laser telemetry system, and powered traverse. 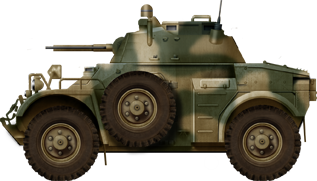 The French Panhard M3 was an APC development of the AML. The total production claimed by the firm, which included the M3 Buffalo APC (which was often purchased at the same time due to the high commonality between the two models) was 6035, and in addition 1100 were made under licence. In the late 1980s, Panhard offered a conversion kit to retrofit the new Peugeot XD3T liquid-cooled diesel engine in the customers’ own facilities with only a basic equipment. This came with a more powerful air compressor, and Citroen type disc brakes on the front wheels. In 1993, Ireland was the latest country to receive this package. Eight countries upgraded their AML using this package, which is no longer offered. Other upgrades includes the replacement of infra-red night vision equipment sets used by the crew by a new image intensification system, installation of a laser range-finder above the 90 mm gun (first round hit capability), and modifications on the muzzle brake and recoil brake to fire Giat Industries APFSDS ammunition. 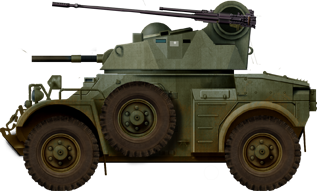 The vehicle was as rugged, reliable, fast and heavily armed, and became an outstanding export success for Panhard, produced for over three decades for 50+ customers and used by many political factions, chiefly in Africa and the middle east. Algeria: 54 AML-60, Angola: Operated some captured from Portugal, Burkina Faso: 15, Burundi: 30, Cameroon: 31; ex-Bosnian Army, Chad: 85, Côte d’Ivoire: 20, Democratic Republic of Congo: 60, Djibouti: 24, Ethiopia 56 AML-60 (no longer in service), FNLA: 1 AML-90 now on display at the Museu das Forças Armadas, Luanda, Gabon: 18, Kenya: 82 modernized later by an Israeli firm in 2007, Lesotho: 6 AML-90 (4 operational as of today), Libya: 20 AML-90 (no longer in service), Mauritania: 60 (39 AML-90 and 20 AML-60), Morocco: 230, Niger: 36, Nigeria: 137, Rwanda: 15, Sahrawi Republic (? ), Saudi Arabia: 230; Senegal: 54, Somalia: 15 AML-90, South Africa: 118 AML-60s of 1962, replaced by the Eland Mk2 built under licence by Sandock-Austral Limited, Sudan: 6 AML-90, Togo: 10, Tunisia: 18, UNITA: 4 AMLs acquired clandestinely through Zaire (in action in the Angolan Civil War), Yemen: 185 (15? ), Zimbabwe 20. Argentina: 50 AML-90, Dominican Republic: 20 AML-90, Ecuador: 27, El Salvador: 12 AML-90, Venezuela: 22. Burma: 50, Cambodia: 15 AML-60s in service between 1965 and 1975, Malaysia: 140 AML-60 and AML-90s (No more active), Pakistan: AML-60. France: Varying from 1000 to 700, now all deactivated but a few. 210 AML-90s and 425 AML 60-7s were purchased by the Army, 70 AML 60-7s and 45 AML 90s by the French Gendamerie. These were replaced in the 1980s by the heavier Panhard Sagaie and deactivated for the last in the early 1990s. Bosnia and Herzegovina: 10 AML-90. Ireland: Irish Defence Forces AML-20 and 90s (retired in 2013). Portugal: 56 AML-60, some AML-90s (all retired). Spain: 140 AML-60 and AML-90s (all retired). Bahrain: 23 AML-90, Egypt, Iraq: 170 delivered in 1967-1976 (10 operational), Lebanon: 74 (Amal Party: Ex-Lebanese Armed Forces (LAF) vehicles; Lebanese Forces: 12 AML-90 inherited from the LAF. ), Israel: 29 AML-90, Saudi Arabia: 235 (purchased from France in 1967), United Arab Emirates: 90 AML-90. 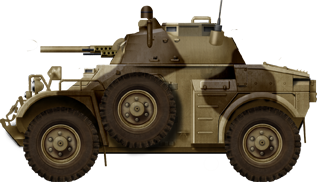 Early on, French AMLs saw limited action in the Algerian War, which was about to end. 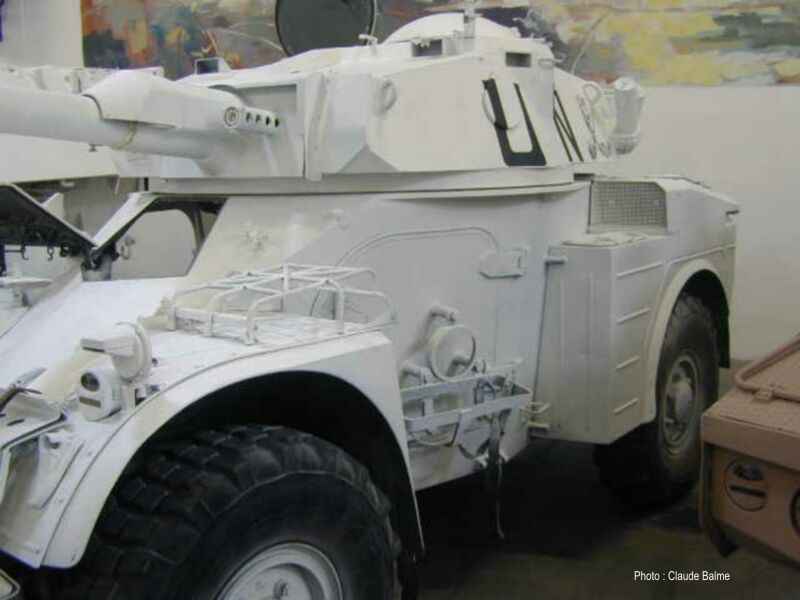 In Lebanon, Irish vehicles were comitted in heavy action under UNIFIL in Lebanon, notably distinguished themselves at Atiri in South Lebanon in 1980. Lebanese regular forces had more than fifty AMLs, which heavily engaged during the civil war, and largely distributed among political and religious factions. During the Falkland war, the Argentinian Escuadron de Exploracion Caballeria Blindada 181 and Escuadron de Exploracion Caballeria Blindada 10 deployed their AML-90s near Port Stanley. Some participated in the only armoured action during the war, at the Battle of Wireless Ridge, against Blues & Royals squadrons light Scimitars and Scorpions. Operation desert Storm (feb. 1991): Iraqi AML-90s or recon units were deployed against USMC and the Saudi Arabian National Guard during the battle of Khafji, taking heavy losses. Salvadoran Civil War : At least one AML-90 was destroyed by FMLN insurgents, apparently using a M97 recoiless gun and rifle grenades. 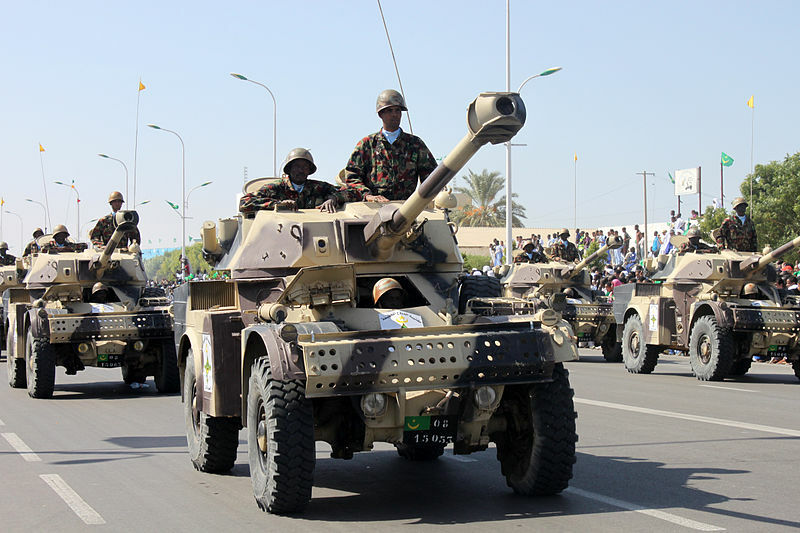 Toyota War: Chadian forces were able to mount efficient attacks into Libyan armored formations, using in combination Milan AT missile teams, ambushing T-55s. These vehicles were also seen in action in South Rhodesia (1970-1980), in Katanga during the civil war in Zaire and at Kolwezi, by Chadian government forces during the civil wars in 2005, in the Kenya intervention in Somalia in 2010. 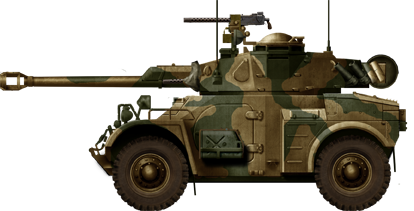 The South African Elands saw action in Angola and Rhodesia in 1978. Panhard AML-60 of the first production in Algeria, 1961. French Panhard AML-60 in service in the Sahara, 1962. 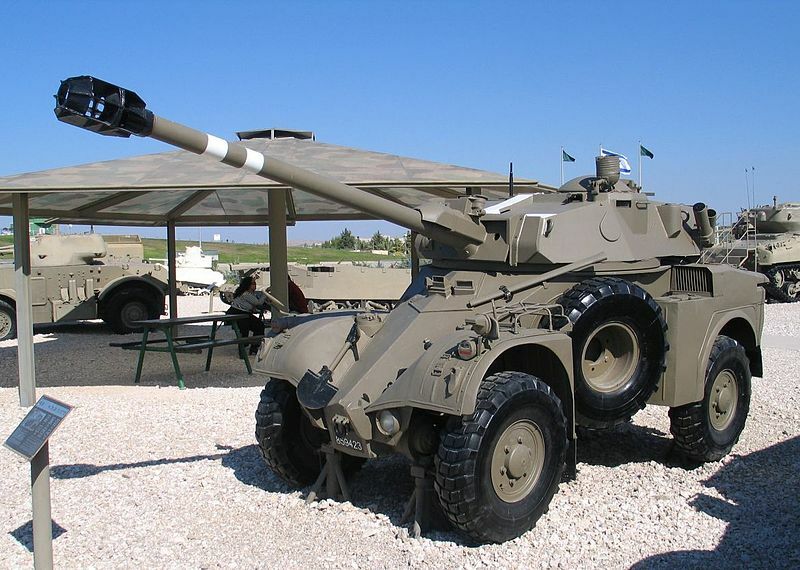 Panhard AML-60, with a coaxial 20 mm autocannon. Portuguese AML 60-20 in Angola, 1968. French AML-60-20 with CNMP turret, for the export market. South African Eland 90, a licence-built AML 90, South Rhodesia, 1970s. Argentinian AML 90, Escuadron de Exploracion Caballeria Blindada 181, Port Stanley, Falklands, 1982. French Panhard AML 90 Lynx (with passive night vision equipment and laser telemetry system), 1990s. 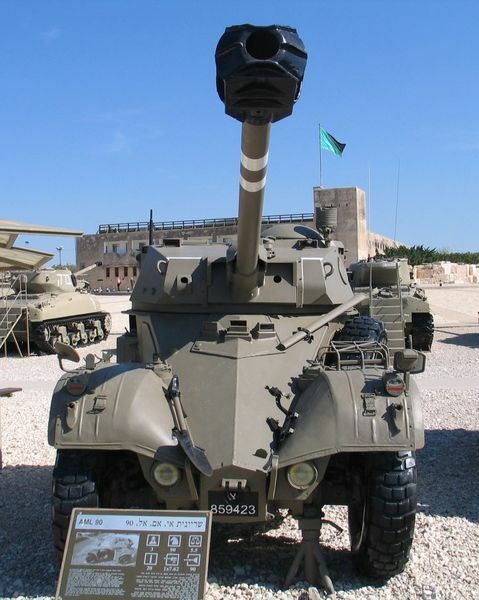 The information here stating the AML’s 90mm F1 gun is the same as the one found on the AMX-13 is inaccurate. The AMX-13s used a much higher velocity 90mm F3 gun, which was an older 75mm rebored to fire 90mm shells. It has no relation to the low velocity F1. This has been verified and validated. 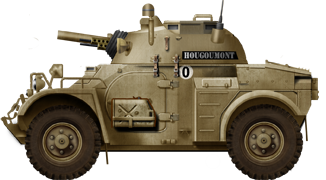 What is the armor like on the Panhard 90 and the Panhard 60? Basically, non-existent. Any hits by 20mm, 25mm or higher autocanons can probably penetrate it no problem. This thing is built for speed, not armor.